It’s here! The holiday season, a time filled with love and peace and joy and family and friend and parties and…calories — loads of them! 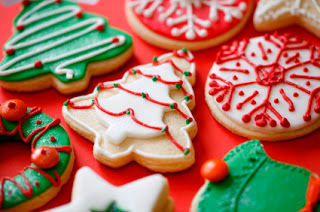 The holidays seem to be a time when all our eating guidelines and values go out the window, because who can resist that table of cookies, or the eggnog and holiday feast we only get once a year? This year however, you have us and we are giving you tips on how to stay mindful this season so you can enjoy the seasonal treats and festivities without spending the month in discomfort and planning the next six months around weight loss. What does this mean? It means eating with attention and intention, and this can be difficult to do on a day to day basis, let alone through the holidays. However, it is a practice that that is worth mastering. Start by following these simple steps each time you are sitting for a meal or mindlessly munching. An important first question to ask yourself before you eat, it is a chance to ask your body how it is feeling and what it needs. While building your plate, start by asking yourself “what do I really feel like eating?” Choose foods that you feel your body needs most, or will bring you the most pleasure, and leave the others behind. This can be at the table saying grace with family and friends, or it can be a reflective moment to yourself in which you take a breath before diving into your plate. This moment is a chance to refocus, slow down and be grateful for the delicious meal. We can often get so excited by the event or pick up on the energy of others that we gobble down our food so quickly our plate is empty before we realize we even started eating. This leaves us too full, bloated and gassy — not a good combination. By slowing down and chewing our food thoroughly (try for 20 chews) we have more control over how full we are feeling and it’s guaranteed to diminish the bloating and gas. Slow down and join in the conversation! Remember, you don’t have to try EVERYTHING. Sometimes I find myself eating things though the holidays that I don’t even like. Maybe it is sensory overload? Maybe it is just the excitement of the season? Whatever it is, when this happens to you, ask yourself “Is this even enjoyable?” Because if not, put it down, walk away and don’t look back. WholeLife Holistic Nutrition Inc. is wishing you the happiest holiday season filled with love and beautiful food. With these mindful eating tips you can savour the holidays and eliminate the discomfort of gas, bloating and weight gain!